Gorgeous hair is the best revenge..
..true! The best of assets that one can have is beautiful hair. With this, I also would add that every person looks beautiful in their own special way, and having beautiful hair or not, doesn’t really define you. But, we can’t also neglect those people who are suffering from immense hair fall and they wish to find a solution to it. Recently, I was introduced to Satthwa Hair Oil which is a premium Hair Fall control oil and guarantees lesser hairfall with time. It is paraben free and constitutes of Olive oil, Castor oil, Vitamin E, Almond oil, Grapeseed oil, Coconut oil, Jojoba oil, Amla oil and Emu oil. These ingredients are enough to act as superfoods for our hair & scalp, and help tackle all sorts of hair problems. 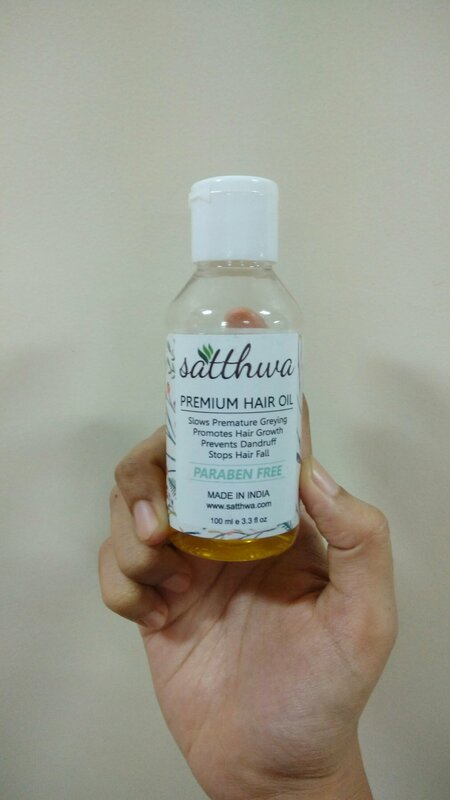 Why Satthwa Premium Hair Fall Control Oil? It contains Omega 6 & 9, Iron, Calcium, Magnesium and rare Vitamin K from Sweet Almond oil. Ricinoleic acid from Castor oil which makes hair darker and stops premature greying. Has Lauric acid from Extra Virgin Coconut oil. Jojoba oil which is Anti-fungal & cleanses the scalp by unclogging pores. Vitamin E contains d-alpha Tocopherol. Amla oil which is rich in Vitamin C. Grapeseed oil which delays skin aging. Emu oil stimulates dormant hair follicles and helps in new hair growth. Extra Virgin Olive oil treats dry and damaged hair. How #akatheversatile found Satthwa Premium Hair Fall Control Oil? I loved the packaging and the texture of the oil is very smooth and perfect. It has a very pleasant fragrance to it and using it for almost a week’s time, I found it very effective on my hair and scalp. I had severe dandruff issues and hairfall, but using this, I found positive results on my hair problems. This has thus proved to be a successful and effective product. I’d completely recommend this product to all my followers and readers. It is priced reasonably and you can buy them on Amazon and visit their site. Do you have hairfall issues? Why not try Satthwa Premium Hair Fall Control Oil? Share your thoughts and ideas in the comment section.